LATEST NEWS: Places still available for violins, violas and cellos. There will be three timetabled sessions each day, which will be divided between full orchestral, sectional and ensemble sessions. Specialist coaches will take the sectional and ensemble sessions, and, in the case of strings, will lead the sections. 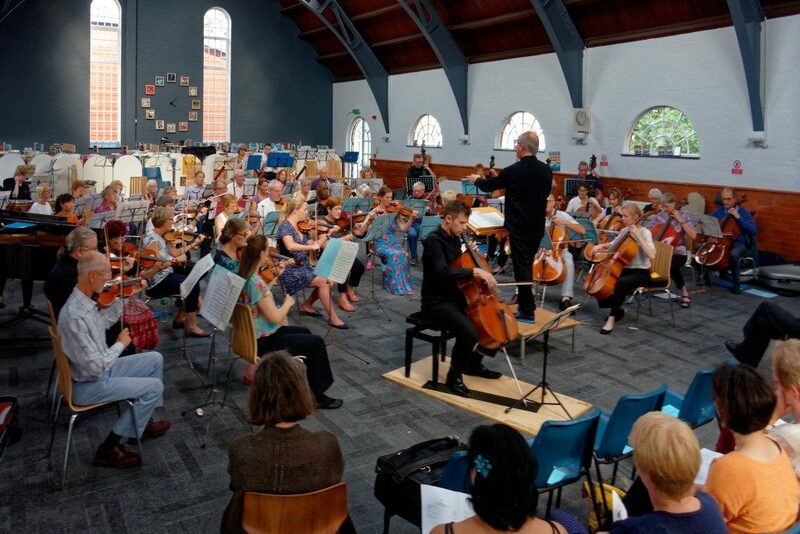 Sectional rehearsals will concentrate on concert repertoire, and the ensemble sessions will provide opportunities to explore more specialist repertoire for strings, wind and brass. In addition to timetabled sessions, there are opportunities during the week to form ad hoc ensembles, and members are encouraged to bring sets of music for that purpose, as these are not provided by the summer school. Members may also participate in the full range of optional activities, including the open choir. This course is intended for instrumentalists of approximately Grades 5-7 but applications from string players of a slightly lower standard than that, who have good experience, will be considered. Clarinettists should bring both B flat and A instruments if possible. Steve Bingham will once again be conducting the Sinfonietta, bringing his boundless enthusiasm to the ensemble. Alongside preparing repertoire for the end of course concert there will also be two sessions devoted to additional repertoire pieces, so as to give as much variety as possible to the week’s music making. In 2019 the Sinfonietta will be tackling a fascinating range of music from the minimalism of Michael Nyman to the lush late romantic textures of Arnold Schoenberg! Between these there’s French Impressionism and a neglected work by Gustav Holst, giving the Sinfonietta players plenty to enjoy. String tutor David Lewis will take two sessions with the Sinfonietta strings, giving them the chance to explore some of the rich string repertoire, whilst our string coaches have time with their respective sections during the week to improve all aspects of orchestral technique. Our woodwind co-ordinator, Margaret Archibald, assisted by our part time tutors, will explore wind repertoire and work with the woodwind players on technical challenges, whilst the brass players – not to be left out! – have their own ensemble sessions and concert.